Welcome to the first post in what will hopefully become a monthly series on my blog! This year I’ve decided to write monthly review posts, where I go through the projects and things that I focused on over that four week period. If I’m feeling ambitious I may set goals for the following month, too. I’m hoping this will motivate me to write more (since I can write the post throughout the month), write about a bigger variety of things (not everything has to be sewing related), and give me a visual reference of everything I did throughout the year when we get to 2019. It also gives me an opportunity to talk about smaller projects that I haven’t documented well enough to write full posts about. This year I plan on focusing more on youtube, and it can be tricky to film the making of a project and take enough photos for a thorough write up. I ran into this problem last year too, and ended up not posting about a lot of the costumes I sewed. This type of format gives me a place to share those pieces on my blog, without having to make a post all about them. Don’t worry – I will still have a lot of “Making of” posts going up, this is just a supplement to them! The rest of this post will be organized by the date things happened, but I wanted to start off with the most exciting part of January – my McCall’s Pattern! If you follow me anywhere else you will have heard about this over a month ago, but I haven’t announced it here yet. Back in early 2017 I was contacted by the McCall Pattern Company, and went to tour their NYC headquarters. Shortly after that I signed a contract, and now a little less than a year later my first pattern is officially out! It is pattern M7732, from the early spring launch. It is avalible online, and wherever McCall’s patterns are sold! 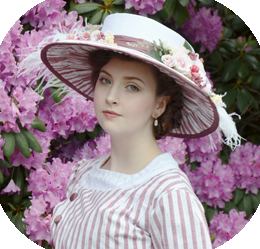 The pattern is of my 1890’s walking suit and includes the skirt, blouse, and jacket pattern. They’ve even included instructions for all the fun details, like the diagonal grain line and soutache detailing! This has been such an incredibly experience and I’m so excited to FINALLY be able to share it! I won’t ramble on too long about it here, since I go more in depth on my thoughts in this video. But I will say that I’m really grateful to have this opportunity. And for all of you, who have been part of making this happen. I wouldn’t get opportunities like this is weren’t for the fact that people have read my blog and shared my posts over the years. I’m also extremely grateful for all the people at McCall’s who have made this a reality. I designed the costume, made the base pattern, made the sample garment, and modeled the piece, but SO much more than that goes into creating a commercial pattern. Dozens of people have worked on this and it would have never made it even close to the shelves without them. So thanks to everyone involved, and everyone reading this. It means a lot to me! And an extra thank you to the people who have purchased it. I’ve been told that it is the bestselling pattern of the new releases (eep!!) which is just incredible. I was so worried no one would buy it so to hear that has brought me SO much joy! I’d hoped to jump into January with a bunch of new sewing projects, but the first day of 2018 was spent organizing instead. I made the decision to redecorate my bedroom in December, which was a bigger undertaking than I had anticipated. I know I’m lucky to have my own bedroom, but I’ve never really liked the room. It’s always been a little sad and messy looking, with furniture that was too big for the space while also not providing enough storage. I mean it was fine but I was never in there unless I had to sleep, because I didn’t want to be in there. So in December I started looking for things to improve it, and I came across a vintage six piece bedroom set, which was much more in line with the style I like now. The set was $250 and avalible for local pickup. My dad and I managed to get it home, but it wasn’t brought upstairs until the 31st, which made January 1st the first day I could organize things. I wasn’t going to write about this, but I’m really happy with how it turned out. And I think you’ll see a fair bit of it in future videos and blog posts, so it made sense to mention it here. The new layout and furniture makes the room look so much bigger, and it displays all of my knick knacks perfectly. I’m especially fond of the settee from the 1880’s, which I recently reupholstered with pink velvet. It sits in front of framed (original!) fashion plates from the 1830’s and 1860’s. The hutch over the dresser stores my hats, jewelry, and a few figurines that don’t fit in my sewing room. But my favorite part has to be the lamps. These are from the 1940’s by the company Von Schierholz. They weigh 20 pounds each, and stand more than three feet tall. I found them in antique store and fell in love. They were a little more expensive than I had wanted but I couldn’t leave them behind. Now they are all polished up and the perfect addition to the room! Once I buy artwork this space will be done. January 2nd was the day my pattern came out. It was also the day I started on my 1950’s ensemble, which I’ve already written about here. I also published my first fabric haul in many many months, which can be watched here – I go through lots of 20th century sewing plans which should keep me busy for the next few months! On January 3rd I shipped out a dress and cloak that took me half of December to finish. This piece is a remake of my “Dewdrop Dress” from several years back. I love how the dress turned out, but the cloak was a nightmare. I made the decision to line it, which was an awful idea. I ended up with a puckered uneven hem, even after letting the fabric hang for several days before trimming and sewing. I don’t think I’ve been that disappointed in a project in a very long time, and I was not happy to be sending it off in that condition. But from a distance it looks nice! And I know the experts will work their magic on the pattern for this. I wish I had worn photos but I didn’t get a chance to take any! January 5th was the first day I started properly working on the green swing coat, meaning it became my primary focus. I also began work on the matching pillbox hat, which was finished the following day. By January 8th the coat, hat, and coordinating dress were all complete. This was also the day I heard my pattern was selling well, which was super exciting! Unfortunately the following week kind of sucked. I had a really awful headache from the 9th until the 17th and found it really difficult to focus on anything. But on the 13th I went to Jo-anns and saw my pattern in stores for the first time! I also posted the announcement video about it. On the 18th, when my headache FINALLY went away I got straight to work on a 1940’s design. I’d been wanting to make this dress for a while, ever since I saw this image. I thought the gathering was really interesting and new it would be a fun challenge to recreate. I was right! It was fun, and in two days the dress was done. I ended up loving the pattern I drafted, but disliking the dress. I don’t think beige is my color, so I’m eager to recreate it from another fabric! There will be a write up about this piece early next week. January 20 was probably the biggest turning point I’ve had in a while. I realized I had 12+ videos fully filmed and none of them were edited. I want to focus more on my videos this year, and that isn’t going to be successful unless I actually edit and upload them. To try and change this, I decided to reward myself with a bit of spending money every time I finish one, and oh boy did this make all the difference. I ended up editing two videos THAT DAY. And a total of 9 videos in January, which is almost the amount I uploaded in all of 2017! That little prize at the end gives me all the motivation I need to pick editing over watching other peoples videos…or playing online tetris. So that has been awesome. And I’ve put most of my reward money into vintage clothing, since I’ve decided to start guiding my wardrobe in that direction. I may start doing hauls and accumulative outfit of the day posts on that, but it will be a while until I get to that point. So far I’ve been buying a lot of NOS basic tops and sweaters, since those are pieces I’m less inclined to sew for myself. I have also picked up some fabric with the intention of making my own pieces. 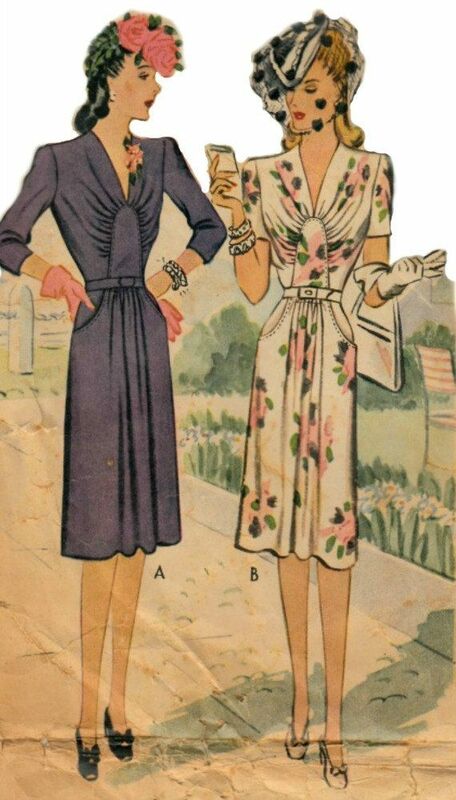 Since it’s still winter I’ll start with a few pairs of pants, but I will be making some more 1940’s style dresses and skirts when it begins to get warmer! The rest of my week was spent filming and editing. On the 22nd I made a pink pillbox hat and filmed the process for this video. Then on the 23 that was edited, along with a vlog about making the 1940’s dress. The following day I filmed another video and finished two others. My dad was off work for the rest of January, which made the next couple weeks feel like a really long weekend. So I didn’t get as much done as I should have, but I did make an edwardian chemise! Like always, I draped the pattern myself. Then I turned that into a pattern, and the pattern was cut from an eyelet cotton. I hemmed the edges of each piece, and topstitched them to 1/2″ lace that was used to create bands of lace inset work. This was my first time attempting this technique and I really enjoyed it. There is something really satisfying about it, and the end result is so pretty! The front of this piece also features pintucks and gathers…so it was kind of complicated to piece together, but still fun. It closes with buttons at the front, and has ribbon in the neckline to gather it down and prevent gaping. The skirt is gathered at the waist, with pintucks, ruffles, and more lace sewn around the hem. Overall, a really fun two day project. And a huge upgrade from my previous uncomfortable (and ugly) edwardian chemise! It was also nice to get this cotton out of my fabric stash and turned into something practical. I believe this originally cost me $3/yd – and the lace I used was 50c for the lot of 15 yards since it had yellowed slightly! That piece will be worn under another project from January, which is a skirt made from an original pattern patented in 1909. This is the first piece in my “Sewing through the decades” series which I’m really excited about. For this series I will be following at least one original pattern every month, each from a different decade of the 20th century. This series is primarily going to be documented through videos on my youtube channel, but finished photos of each piece will be posted here. This skirt was constructed entirely with lapped seams, which was a first for me! It is shaped with eight gored panels, and four “inserted pieces” which feature inverted box pleats. Definitely an interesting piece to make, especially following instructions that are over 100 years old! I also began on the mockup for the next project in this series, which was…I don’t want to say a disaster, but it was close. I’ll leave the rant about this pattern for another day, but I will say that this pattern makes no sense whatsoever. I’m not sure who wrote the instructions and how on earth they expected any human being to understand them. I DID end up figuring it out. It only took me three attempts and many hours. And the final project for January was a hat. Specifically a heart shaped hat. I got this idea after filming my pillbox hat tutorial – what would a hat look like if the crown was shaped like a star, or triangle, or heart as opposed to a circle? I got really stuck on the heart idea since they kind of have the shape of a 50’s fascinator. So it seemed like something that could be pulled off without looking too ridiculous. I played around with cardboard for half an hour to see if I could come up with anything I liked, and somehow, I did! Okay so that doesn’t look like much. But here it is made out of real fabrics! The finished hat has a curved brim so it rounds over the head, and looks pretty normal when worn. I’d hoped it would be more recognizable as a heart when it’s on, but I also like that it is subtle. I filmed the making of this for a tutorial, which can be watched here. And @ursuly_seeews was nice enough to do the lineart and text work to turn my messy pattern into something beautiful and printable! The measurements I followed are listed on the pattern for the sake of consistency, BUT my hat ended up pretty big. I like how it looks from the front but it did gape away at the back of my scalp. If my hair wasn’t curled to fill it out, it would have looked pretty silly. I’d personally recommend sizing the hat down so it isn’t quite as overwhelming. This would also make it more visible as a heart when worn. And that was it from me for January. I had a few other things I had hoped to get done, but I think it was a good start to the year. Work on my website. There are a lot of dead links and pages missing information ever since I changed the layout a few months back. I need to take a few days and get the bulk of it fixed, I’ve just been procrastinating. 2. FILM ALL THE THINGS! I want to launch a Patreon on March 1st, which means having at least 6 exclusive videos done, along with the first three sewing through the decades videos and behind the scenes vlogs. 3. Start on something ridiculous. Even though the things I’ve made so far this year have been historical, they haven’t been huge elaborate pieces (or elaborate at all). I’ve enjoyed them, but I miss ruffles on ruffles and huge hats with piles of feathers! I want to start on a project that has at least one of those things. And I think that is the end of this post. Let me know what you thought of it! I know I enjoyed writing it, and I think I’ll enjoy looking back on it too. Congratulations Angela! No more deserving person was there ever 🙂 You’ve worked tirelessly to make your dream come true and you are so incredibly gifted! I’m sure this is only the beginning of a successful career in costume design. Angela, I’m so pleased for you. You are so young and accomplished. I’m enjoying following you. I wish you much success. Bravo Angela, though I’m not too surprised you’ve been talent-spotted by one of the big firms. I hope you have a lot of fun and success with this. Love the chemise and the heart hat. You’re so talented! I can’t wait to buy your pattern. 💕 The heart-shaped hat is so cute, I love it! First, Congratulations on the pattern! Second, I always find what you working on interesting, so please keep blogging about it here. I get that finding time to keep on various media can be hard, but I do love reading your blog! Congrats again. Your pattern is so pretty. Congrats on that. Also your makes are beautiful. I have never sewn anything vintage but I love it all. Looking forward to more videos, blogs and pictures. Congratulate for all your work. I love reading all your post, I will buy your pattern as soon as I find it in French. I love all your creations, congratulations, continue like that, I would have loved to find my passion as young as you and have the opportunity to practice it every day and live. Although I suspect it must not be easy every day at the beginning. Courage, I’m sure you have a great future in this environment. Congradulations on your pattern! Such exciting news. You have been sooooo busy! Thanks for sharing! Inspiring! Congratulations! Have admired your talent for some time and am happy to see it recognized. Congratulations on your pattern! That outfit is one of my all time favourites. Hi Angela! I’ve been following you and watching your videos for quite some time and I enjoy them so much! I’ve been sewing for years and although I have no interest in historic costumes I find your work SO inspiring, and just listening you talk about your process makes me wanna create something. On a separate note, that edwardian chemise is gorgeous! Don’t you think it would make a great summer dress, if made in a different fabric? For some reason this style is giving me a definite ’70s vibe (I mean 1970s 😄), which is something I do like a lot. I’m really tempted to make something similar after seeing yours, I hope you won’t mind terribly. Congratulations on your pattern. It’s a wonderful achievement. The patterns that I think would be a big McCalls success are the Edwardian cotton striped dress and the green Edwardian gown. Love all the patterns! So amazing! Do you have a video on how to put interfacing in by any chance? I ordered a pattern from the 1950s for my 10yo daughter, but stalled out because I can’t figure out how to do this one (probably simple) step. The directions assume you all ready know how to do this given the time period. Thank you! Keep up the good work! Congratulations! Love that dress, I will be going to get to get the pattern this week. Hope they make a lot more of your styles and include the hats. Thanks for sharing all your hard work. Congratulations! I’m so happy for you, 10000% deserved. I love your looks and the detailing. Can I say I’m so excited to see your wardrobe coming together? I’ve been meaning to make more wearable vintage pieces this year so I can’t wait to see what you make. Congratulations! No wonder your pattern is selling well, it’s beautiful, detailed and authentic looking! Oh and the heart shaped hat is ingenious! Angela! I just saw your Renaissance pattern in the McCalls Spring book!! Congratulations! Missing you, hope you’re okay.